The tipi site is set in a two acre meadow, part of 23 acres of meadows fields and ancient woodland, next to the well-known 1066 Walk and only 5 miles from the coast. Your view from the tipis will be over the gently sloping fields and our 14 acre woodland which is perfect for children to play in. The proximity to the woodlands means the meadows are popular sites for all manner of wildlife including deer, badgers, foxes, birds of prey and a resident Barn Owl. Closer to home, we invite you to spend the day exploring our site which includes ancient broad leaf Wartling Wood. The 1066 walk passes through our woods giving you walking/cycle access to the beautiful Sussex countryside .We have 2 great pubs within 1 ½ miles of our site serving fantastic food and local ales. There are numerous historic sites and tourist attractions available locally for you to enjoy, including Pevensey Castle, the seaside villages of Pevensey and Norman’s Bay, site of the Norman landings in 1066. Our purpose built toilet and shower block (complete with disabled facilities) will provide you with hot showers, clean toilets and electricity points; everything you need to make your stay as comfortable as possible. 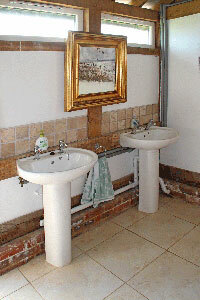 We also have a covered washing up area, but sadly you will have to do the washing up! A small communal fridge is also available should you wish to keep and food or more likely, a nice bottle of wine chilled.